Here the fi are the nonlinear component functions, F is the vector (f1, f2, ..., fn), and x is the vector (x1, x2, ..., xn). In two dimensions, the solution can be visualized as the intersection of two planar curves. An example for n = 2 is shown at the right. The two curves meet at the solution (x, y) = (1, 2). In SAS/IML software, you can use the NLPLM or NLPHQN methods to solve the corresponding least-squares problem. Namely, find the value of x that minimizes || F(x) ||. In SAS/ETS software, you can use the SOLVE statement in PROC MODEL to solve the system. In SAS/STAT software, you can use the NLIN procedure to solve the system. In SAS/OR software, you can use PROC OPTMODEL to solve the system. When n = 1, the problem is one-dimensional. You can use the FROOT function in SAS/IML software to find the root of a one-dimensional function. You can also use the SOLVE function in conjunction with PROC FCMP. You can verify that the value (x, y, z)=(1, 2, 4) is an exact root of this system. The NLPHQN routine converges to the solution (1, 2, 4). Notice that the first element of the optn vector must contain n, the number of equations in the system. A nice feature of PROC MODEL is that it automatically generates symbolic derivatives and uses them in the solution of the simultaneous equations. If you want to use derivatives in PROC IML, you must specify them yourself. Otherwise, the NLP routines use numerical finite-difference approximations. You can solve a system of equations by using only SAS/STAT software, but you need to know a trick. My colleague who supports PROC NLIN says he has "seen this trick before" but does not know who first thought of it. I saw it in a 2000 paper by Nam, Cho, and Shim (in Korean). 0 = C1(x,y,z)*v1 + C2(x,y,z)*v2 + C3(x,y,z)*v3. To solve this nonlinear system of equations, you can choose the explanatory variables to be coordinate basis functions: v1=(1,0,0), v2=(0,1,0), and v3=(0,0,1). These three observations define three equations for three unknown parameters. In general, if you have n equations in n unknowns, you can specify n coordinate basis functions. The problem contains three parameters and the data contains three observations. Consequently, the standard errors and confidence intervals are not meaningful. The parameter estimates are the solution to the nonlinear simultaneous equations. The solution is (x,y,z)=(1,2,4) and is not shown. In summary, there are multiple ways to solve systems of nonlinear equations in SAS. My favorite ways are the NLPHQN function in SAS/IML and the SOLVE statement in PROC MODEL in SAS/ETS. However, you can also use PROC NLIN in SAS/STAT software or PROC OPTMODEL in SAS/OR. When you need to solve a system of simultaneous nonlinear equations in SAS, you can choose whichever method is most convenient for you. 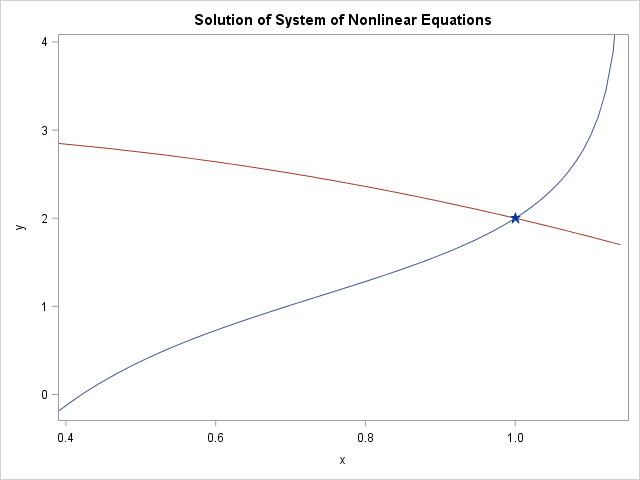 The post Solve a system of nonlinear equations with SAS appeared first on The DO Loop.